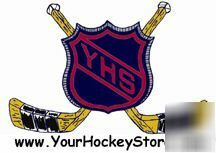 We are offering both our web site domain www.YourHockeyStore.Com and the existing web site for the domain. The web site is up and running. The web site hosting is not included and is the responsibility of the new owner. The web site logo featured above is copyrighted and is not included. Fantastic existing traffic flow. Currently being used for hockey memorabilia but would also make a fantastic domain and web site for any hockey related store. Web site features a fully running shopping cart and is extremely easy to use. The software used is from Product Cart.